Now at last I can go out and make some real pictures. At last those guys wont laugh at me next time I show up for a shooting session. Wooohooo look at that bigma man. Now we are in to some serious shooting busisness. Whos your daddy now. I think I remember correctly that it was the group Akasha that delivered this line in a song, but it seems that every time I update my I tunes or connect the Ipod to the computer some of my music gets lost. To my luck I am a backup freak and thus, not only have all my images backed up on multiple disks, but also my music so I can find out when ever I have time for it. Because of the nature of most articles these days dealing with digital photography work flow I did some digging and found this analog communications image from my files. Communication, specially through the internet, is a key factor in many peoples life today. Working on restructuring this website got me thinking it is almost out of the larva state. Hopefully it wil in the end become beauty like a butterfly. I do not know, but have had nice comments on the progress. Hungry any one.I know I am after trying to get every thing to work these days. No time for any thing but work work work. But who is complaining. The danger of Copyright infringement. There is a popular game going on at the facebook site that is not good from the perspective of copy right. I am stunned to see some photographers partisipate in this game with out thinking, but I also have had some post where they wonder about this. The year 1999 does not seam so far away. But Iceland and the world has lived through lot of changes since then. To day Iceland got the first woman as a prime minister. I will post some images of here as soon as I get them. I don't know but a friend of mine, a film maker has been documenting the turmoil in Iceland since the start. He posts footage at his website and I liked to point it out to you. 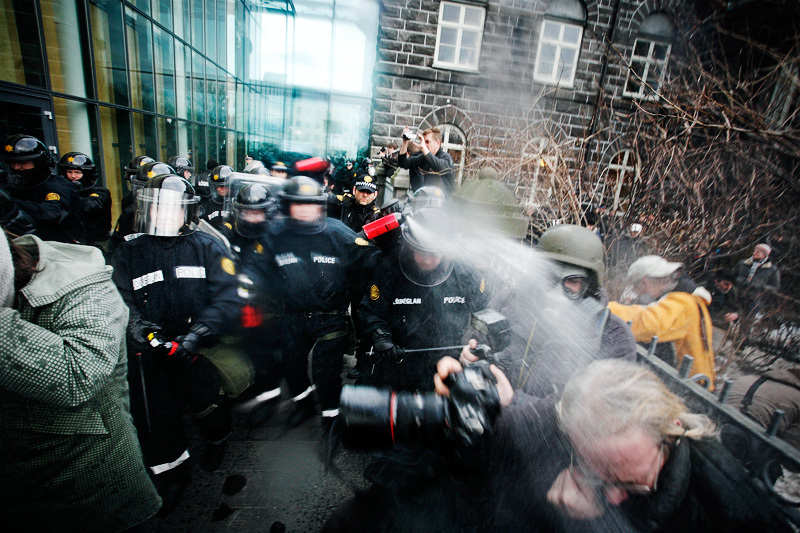 At the moment every thing is quiet and the brutality from both vandals and police in Iceland has been stopped. Now the revolution is peaceful with singing dancing and banging on kitchen utilities . Before getting gased by the police on the 20th I managed to get some shots done. Here is the time line the last minutes before I was hit by the pepper spray. In this here image my point is proofed. The spray was directed at me. This happened to day and yours truly was mazed by the police force in Iceland. Once in a while things do not work just the way you want them to. Then you will have to take a break and do some thing else. Are you one of those that does not have English as your mother language. Why type in 20 keywords when you can type in 5 and let Lightroom take care of the rest. Here is how my dog comes to the rescue. I do have a beautiful dog named Tara. To keyword the pictures of my dog I need at least 7 keywords.